Many healthcare policymakers and analysts are focused on controlling rising medical costs. Is attacking high-cost, low-benefit medical innovation a solution? This column estimates that medical innovation – the use of advanced diagnostic imaging, newer drugs, and higher-ranked physicians – significantly increases life expectancy without raising medical expenditures per capita. The cost of medical care continues to rise rapidly in the US and other industrialised countries. According to a report from consulting firm PricewaterhouseCoopers, US employers who offer health insurance coverage could see a 9% cost increase between 2009 and 2010, and their workers may face an even larger increase. If both of these claims were true, medical innovation would result in the worst of both worlds – a large increase in cost and little or no increase in benefit (in the form of improved health outcomes). However, a study that I have recently performed casts considerable doubt on both of these claims. My findings indicate that medical innovation has yielded significant increases in life expectancy without increasing medical expenditure. My study (Lichtenberg 2009) examines the effect of the quality of medical care, behavioural risk factors, and other variables on life expectancy and medical expenditure using longitudinal state-level data. As shown in Figure 1, the rate of increase of longevity has varied considerably across US states since 1991. I examined the effects of three different measures of the quality of medical care. The first is the average quality of diagnostic imaging procedures, defined as the fraction of procedures that are advanced procedures. The second is the mean vintage (FDA approval year) of outpatient and inpatient prescription drugs. The third is the average quality of practicing physicians, defined as the fraction of physicians that were trained at top-ranked medical schools. I also examined the effects on longevity of three important behavioural risk factors – obesity, smoking, and AIDS incidence – and other variables – education, income, and health insurance coverage – that might be expected to influence longevity growth. My econometric approach controlled for the effects of unobserved factors that vary across states but are relatively stable over time (e.g. 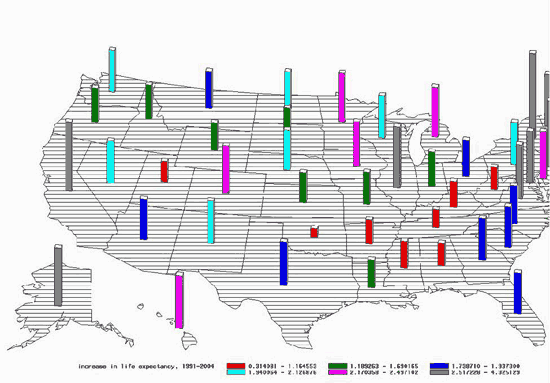 climate and environmental quality), and unobserved factors that change over time but are invariant across states (e.g. changes in federal government policies). The indicators of the quality of diagnostic imaging procedures, drugs, and physicians almost always had positive and statistically significant effects on life expectancy. Life expectancy increased more rapidly in states where (1) the fraction of Medicare diagnostic imaging procedures that were advanced procedures increased more rapidly, (2) the vintage of self- and provider-administered drugs increased more rapidly, and (3) the quality of medical schools previously attended by physicians increased more rapidly. Between 1991 and 2004, life expectancy at birth increased 2.37 years. The estimates imply that, during this period, the increased use of advanced imaging technology increased life expectancy by 0.62-0.71 years, use of newer outpatient prescription drugs increased life expectancy by 0.96-1.26 years, and use of newer provider-administered drugs increased life expectancy by 0.48-0.54 years. The decline in the average quality of medical schools previously attended by physicians reduced life expectancy by 0.28-0.47 years. The availability of data from Australia’s universal health care system, Medicare Australia, allowed me to provide some additional evidence about the impact of advanced imaging technology on mortality. I estimated difference-in-difference models of the effect of advanced imaging innovation on age-specific mortality rates. Demographic groups that had above-average increases in the number of advanced imaging procedures per capita had above-average declines in mortality rates, but changes in mortality rates were uncorrelated across demographic groups with changes in the number of standard imaging procedures per capita. Estimates of the effect of diagnostic imaging innovation on longevity based on Australian data are quite consistent with estimates based on US data. The increased fraction of the population that was overweight or obese, rising from 44% to 59%, reduced the increase in life expectancy by .58-.68 years. The decline in the incidence of AIDS is estimated to have increased life expectancy by .18-.20 years. The small decline in smoking prevalence may have increased life expectancy by about 0.10 years. Growth in life expectancy was uncorrelated across states with health insurance coverage and education, and inversely correlated with per capita income growth. The 19% increase in real per capita income is estimated to have reduced life expectancy by .34-.43 years. The sum of the contributions of all of the factors to the increase in life expectancy is in the 0.85-1.32 year range. Consequently, between 1.05 and 1.52 years of the 2.37-year increase in life expectancy is unexplained. Although states with larger increases in the quality of diagnostic procedures, drugs, and physicians had larger increases in life expectancy, they did not have larger increases in per capita medical expenditure. This may be the case because, while newer diagnostic procedures and drugs are more expensive than their older counterparts, they may reduce the need for costly additional medical treatment. The absence of a correlation across states between medical innovation and expenditure growth is inconsistent with the view that advances in medical technology have contributed to rising overall US health care spending. Increased health insurance coverage is associated with lower growth in per capita medical expenditure. •Kaiser Family Foundation (2007) “How Changes in Medical Technology Affect Health Care Costs,” March. •Lexchin, Joel (2004), “Are new drugs as good as they claim to be?,” Australian Prescriber. •Lichtenberg, Frank, “The Quality of Medical Care, Behavioral Risk Factors, and Longevity Growth,” NBER WP 15068. •Rettig, Richard A. (2007), “Medical Innovation Duels Cost Containment,” Health Affairs (Summer 1994): 15.